a light, reliable and silent power tool. This tool is the most popular type of bench-top tool required in the DIY world. The saw category in our catalog offers a wide range of electric saws to work, without vibrations, on all materials: ferrous and non-ferrous, hard and soft woods, Plexiglas, fiberglass, foam, leather rubber, plastic materials, profiles, and cork, in short, it can be equipped with blades, available on our site, to be able to work on almost any type of materials. Each scroll saw in our catalog is built with solid ground bases on CNC machines, they are in die-cast aluminum or cast iron. The scroll saws are equipped with extremely light magnesium oscillating arms. The electric tunnel has an electronic regulation of the number of strokes, the professional construction also allows an extremely fast blade change and are designed to guarantee maximum silence during operation. The scroll saws in our catalog offes: resistance, precision and very high quality. leading companies in the production of high quality power tools, these brands guarantee the extreme reliability of its tools, in all sectors, from DIY, to modeling and where high precision is required. In our catalog, there are products able to satisfy every need for all levels of professionalism and competence. Number of blade strokes: 900 - 1400 c / min. Blade stroke no. 150 - 2500 c / min. Blade stroke number 900 - 1400 c / min. Blade stroke number 400 - 1600 c / min. Number of blade strokes: 550-1600 c / min. Inclination: 0 - 45 °. Purchase guide for scroll saws and advice for best purchase. Selection of the best brands (Proxxon, Dremel, Einhell). All models ready for delivery to guarantee delivery within 24 hours of purchase. First tip: There are many scroll saws on the market and often those who want to buy one (especially novice users) base their choice on the lowest price, often not considering the most important aspects of this type of product. However, buying the cheapest tool could be the correct choice, but you must take into account the type of work to be done. Second tip: to buy the scroll saw that will allow you to do a lot of work, you must choose one that can mount the blades without the side pins. The standard length of the blades are 130 mm and are inserted into the chuck block and then tightened with an Allen key. Many users , whether or not they are interested in buying, ask themselves what is the best model of a given category (eg. What is the best pressure washer, the best lawnmower, the best tractor etc ...). Unfortunately, there is no clear and definitive answer to this type of question, because each product must be evaluated according to the reference category (an excellent product for hobbyists will almost certainly be judged negatively by professionals in the sector). If this is true, why does the title speak of the best electric tunnel? Simply because all the customers who bought the Pro 460on DS 460 were enthusiastic and happy with their purchase. This machine is perfect both for hobbyists and for users who are looking for more important performance, up to the user who will use in the professional field (of course, in this case, it must be used correctly: it must be left to rest, moderate sessions, and with some breaks ). In addition to this, 10 blades from high-quality Proxxon are included in the package, of which 5 for a rough cut and 5 for a more cutting end. With this model all the blades can be used (both those with the lateral pivot and without). 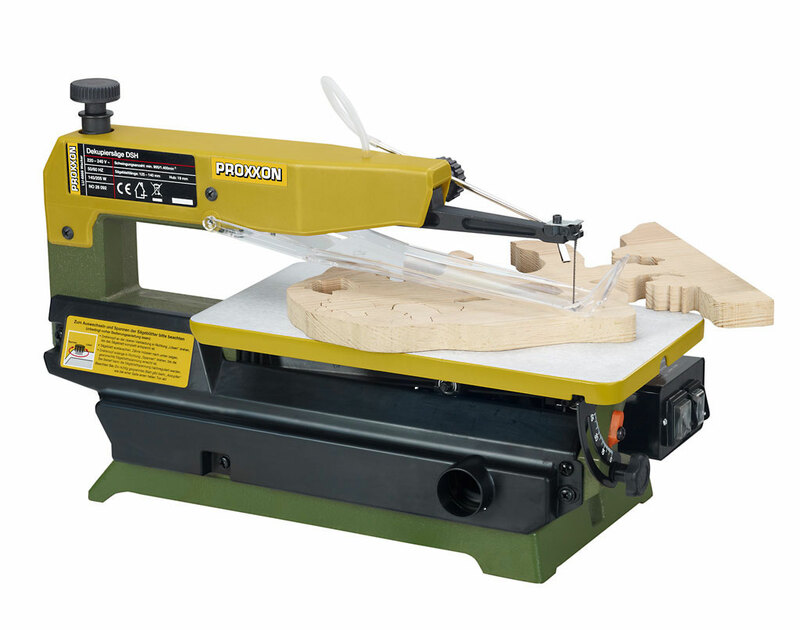 Why buy a Proxxon scroll saw? When buying goods that must last over time and which must ensure quality, performance, reliability, and longevity, it is preferable not to limit yourselves to price as the sole criteria for evaluation. 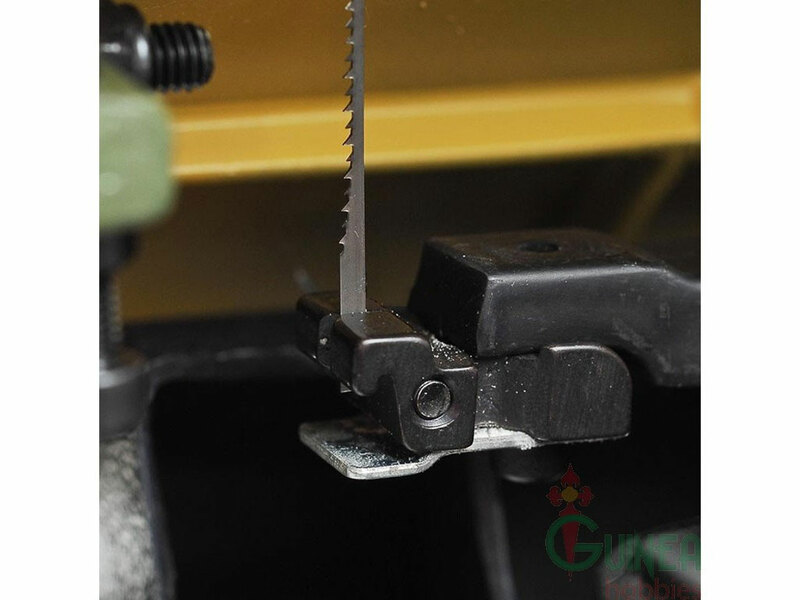 We often receive requests and questions from users who have to choose the saw to buy and one of the recurring factors is, unfortunately, the price. The advice we give is to evaluate well why you need to buy the electric saw. This tool is not a consumer good that has to last for a short time, but a tool that has to last over time. Proxxon has included in its catalog three of the most popular scroll saws and appreciated, covering three price ranges to guarantee everyone the best price/quality ratio. One of the most important factors in using an electrical saw is stability. This tool has replaced the traditional hand saw and the mechanical arm of the saw oscillates vertically, unfortunately causing a high number of vibrations . Especially for less experienced users, these vibrations make the job harder and less precise. Proxxon products, renowned for their quality standards and for the feedback received by almost all users, guarantee maximum control and the lowest number of vibrations and inaccuracies thanks to stable support surfaces. 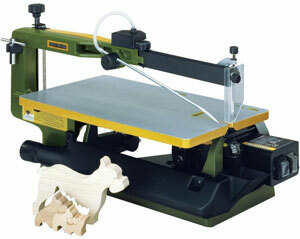 It is not simple choosing among the multitude of offers of scroll saws that are on the internet. Many are imported products , others still, even if of known brands, are simply produced in China and then branded with their own brand. Many are disappointed after the first purchase because it does not last in time and does not guarantee the desired performance or does not allow you to work with serenity and fun. It is not by chance that the best-selling and most requested electric tunnel is the Proxxon Dsh 230 . In the various blogs of the sector, it is very easy to find reviews, opinions, and advice on how to use this model. It is a two-speed saw, designed to meet criteria longevity, stability, reliability, power and robustness . 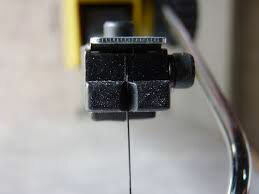 The weight of the machine is 20 kilograms; since it is a substantially stationary product, this is only an advantage. 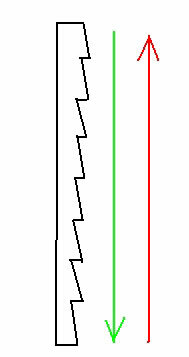 A heavy and well-designed saw will be more stable and will "discharge" more vibrations to the ground. In practical terms, what does this mean? That the processing will be simpler and the cut more precise. The powerful motor that powers this saw is 220V and is induction. These new engines, compared to the previous ones, are more quite, have a better ratio between performance, and consumption and above all, they are more long-lived and do not require maintenance. Proxxon had introduced a variable adjustment with a suitable potentiometer in a selection of saws that are no longer in production. This model has been replaced by the present two settings, from 990 and 1500 rpm, because they had ascertained potential problems concerning regulation over the medium / long term. The switch for adjusting the speed is close to that of the ignition. Depending on the speed setting, the vibrations will be greater or less. The work plan: this is one of the strengths of this model of the scroll saw. The measures are 360 x 180 mm and are made of cast iron . It can be used both flat and inclined thanks to the special adjustment. It can be tilted up to a maximum of 45 degrees and the measurement can be verified thanks to the special graduated scale , placed under the plane and next to the ignition and speed adjustment switches. 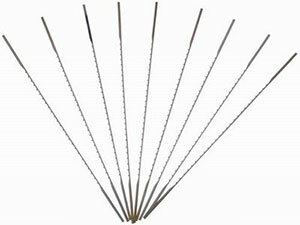 The blades for fretwork: both blades without lateral pins and those with the pin for fixing can be used . This is a great advantage because those with the " smooth ends " can be used for internal carving work (ie. those in which the piece is drilled on the inside, the blade is passed and then fixed in the special blade stop block). Regarding the back is very simple, as shown in the image, the blade must have the flat part of the teeth oriented downwards. The voltage is a much more complex aspect, and the experience and practicality are two very important factors. Inevitably, especially for less experienced users, the blades break very often. The most useful advice we can give in this regard is to stretch the blade until pinching it lightly with a finger, it will give an acute sound. In addition to the adjustment, however, the duration of a blade will depend very much on dexterity. If you "push" the piece on the blade it will inevitably break quickly. With time, practice and experience the operator will learn to feel the right rhythm and push the piece with the right intensity, accompanying it and not forcing the blade. What advantages do the blades have with the fixing pin? 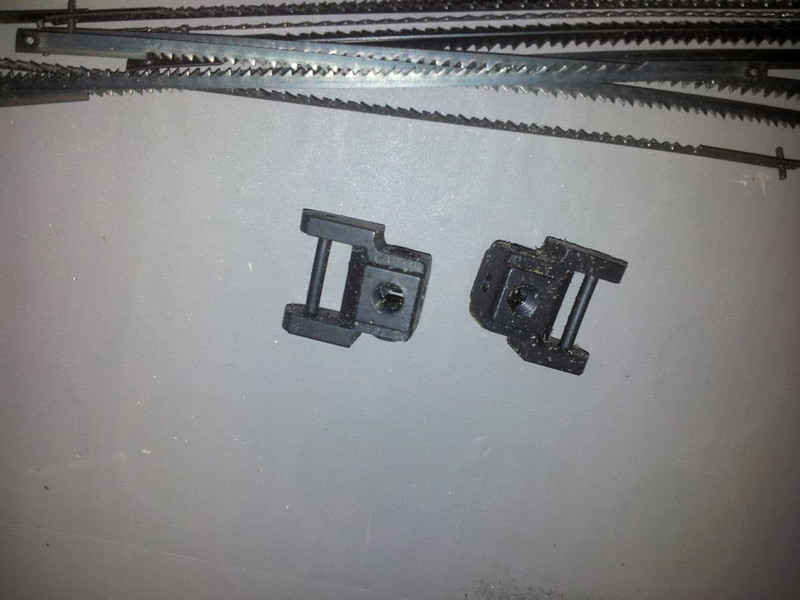 : We receive many requests and questions regarding the blades and their assembly. By their nature, they are very fragile and to limit their breakages and changes it is appropriate to fix them properly. The smooth ones are locked with clamps that tighten on the blade. The blades with the pins instead are fixed in the appropriate slots. Possibility of hooking up to the aspirator: all those who have already used or who regularly use the electric tunnel know very well that the chips and the residues of the processing are many and the working area becomes very dirty. Proxxon put a hook on the back of the tunnel to be able to put the CW-Matic vacuum cleaner on it . This is activated by itself as soon as you turn on the saw, leaving the work area clean. Also from a health point of view, this is very important. The powders of wood or any of the materials that are cut are very thin and spread in the air. For those who occasionally use the tunnel it is not a problem, but for those who use it more intensely, it can cause health problems so it is advisable to adopt security measures . If you can not buy the vacuum cleaner or, for example, there is no useful space, I highly recommend buying masks , even with a low level of security. reduced cost : Although not a professional product, if it is intended for hobbyists; it is undoubtedly the best price / quality ratio on the market. It respects German quality standards, it has been in production for many years and defects and production imperfections have been corrected over time. it can also be used in the semi-professional field : it can also be used for more intense and prolonged work sessions without running the risk of over-exerting it.